I have a wonderful friend named Jennifer, and she is a really classy lady. 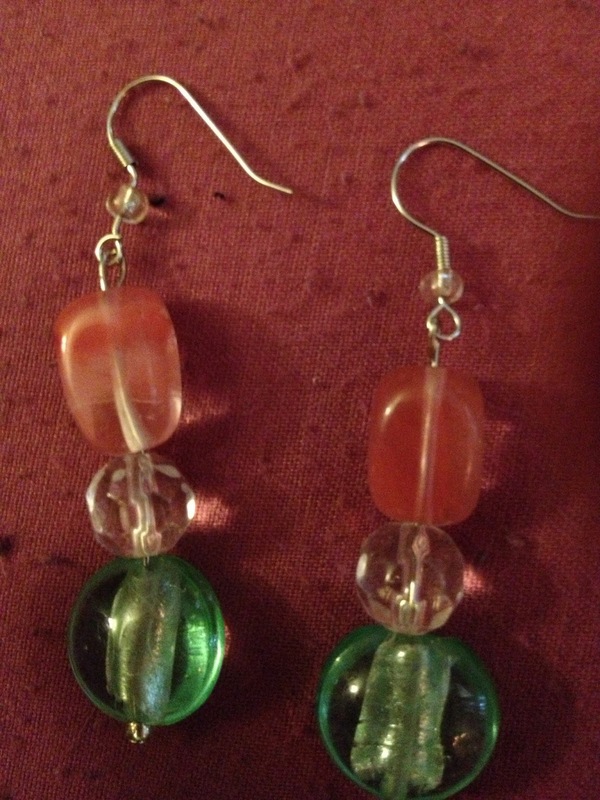 She suggested that we have some lady time and make earrings, which I have never done before. I was really pumped, because I had only ever made friendship bracelets out of floss at summer camp, but never legit, grown-up, fashionable baubles. 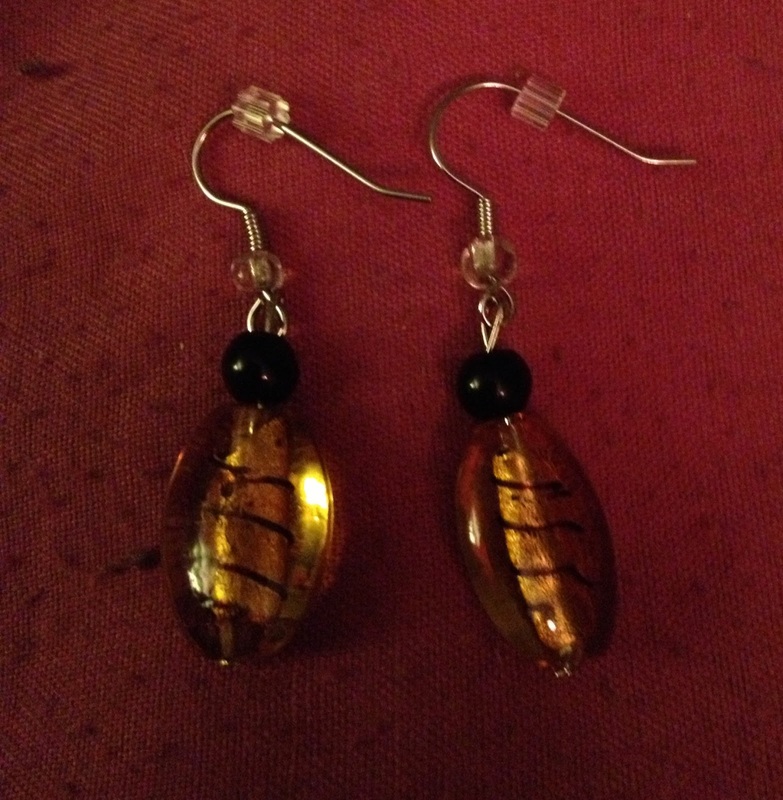 She brought over a fishing lure box filled with beautifully colored beads, tools, and earring parts. 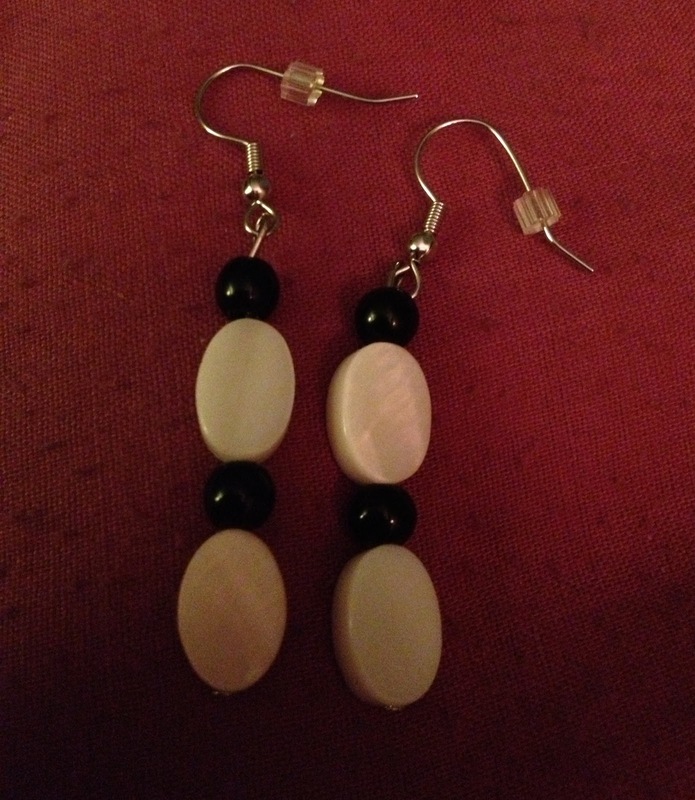 I made 4 pairs, and am excited to share the results with you! 1. Pick out the beads you would like to use. 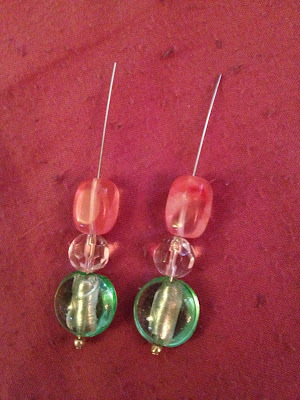 Thread beads in desired order onto headpin. 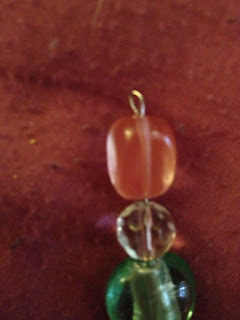 As a note, if the bead hole is too big and falls right through the headpin, first place a small seed bead at the end. I actually had to do that on this pair, if you look closely. 2. 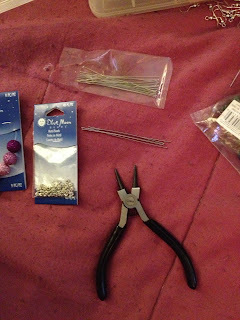 Trim headpin with a wire cutter, until you have enough wire to fold over into a tiny loop. I left about 1/2 inch. It's better to have too much and need to trim more than not enough and have a wasted headpin. 4. Almost done! Take the earring hook and slightly open the loop at the end with the nose pliers, enough to get your headpin loop into it. Then, squeeze the loop back shut securely. 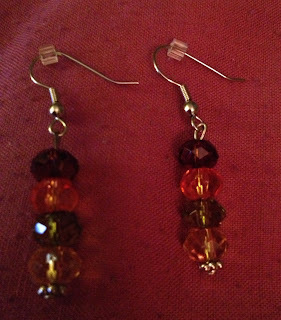 As a side note, you can add a seed bead to the actual earring hook (these ones came with a silver seed bead, and I replaced it with a translucent one by removing the ting spring and replacing it. This was the finished product! I was impressed--pretty sweet, huh? I needed an excuse to buy a new (taller) fan anyways, so I decided this was the perfect opportunity to get creative. 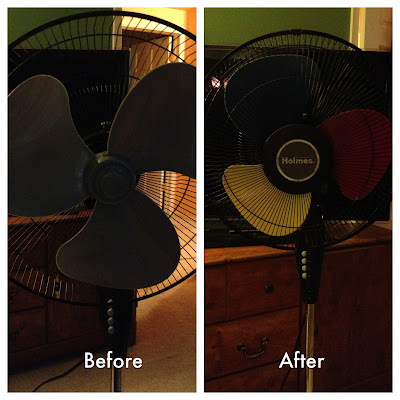 I picked up a fan for $26 at Target, some painter's tape, and spray paint in red, yellow, and blue. BEFORE YOU BEGIN--get a fan that has a slow spinning blade. Otherwise--let's just say, don't expect the above picture unless you have a camera with a slow shutter speed. 1. 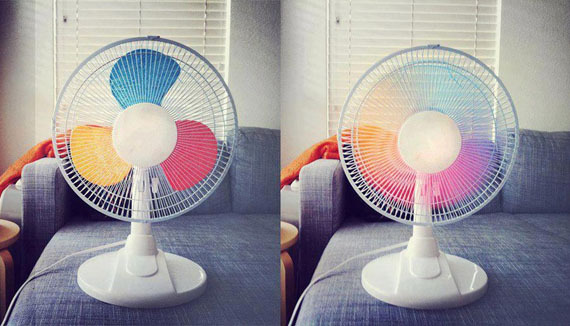 Remove the fan blade from the fan. Cover the middle piece well with painter's tape. 2. Smooth down the edges of the painter's tape with a flat edged tool (we used a paint can opener). 3. 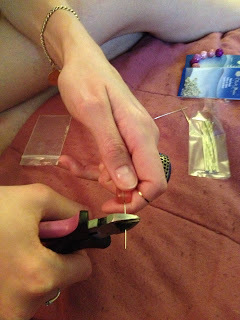 Carefully remove the tape that overlaps onto the blade for a more perfect edge. 4. So, in retrospect, I would have tightly wrapped each blade I was not currently painting with saran wrap or something. I was lazy and just laid ripped up cardboard pieces from the box the fan came in onto the other 2 blades. 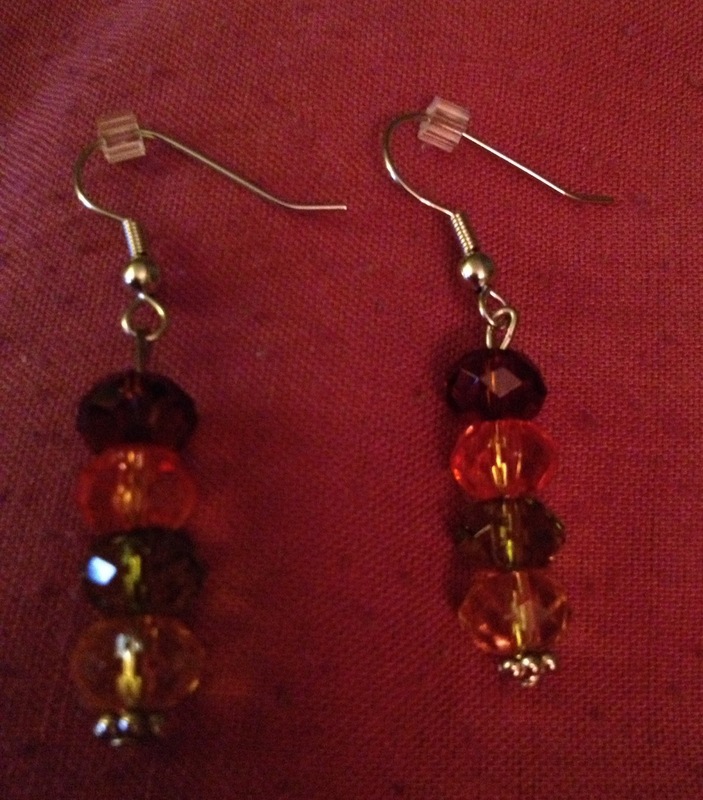 The result wasn't horrible, but not as perfect as I would like. 5. Cover your workspace in newspaper. Spray the first blade with red spray paint, covering it evenly. Don't hold the can too close--just use a thin layer of paint (I will tell you why in a little bit!). Allow to try a solid 45 minutes, just to be safe. 6. Cover the other 2 blades and spray the second blade with yellow spray paint. Allow to dry for 45 minutes. Here's a fun story--we used too much paint because the yellow was initially too light, and the paint ran and clumped and dried in the middle and looked like SHIGGENS. Oops! So we sanded the plastic blade with sandpaper which resulted in it being all scratched up. SHIGGENS! We repainted it with 2 coats of yellow paint. 7. Cover the other 2 blades and spray the third blade with blue spray paint. Allow to dry for 45 minutes. 6. Remove the painter's tape. If touch ups are necessary--don't spray them! Simply get a paintbrush and do the touch ups by hand. 7. Reattach the blade onto the fan. I saw this recipe on Pinterest and was saving it for a lazy day. It only takes an hour to cook! I can handle that, even on a busy work week. 2. Rinse chicken breasts under cold water. Lay flat in oven safe baking dish. 3. Rinse baby red potatoes under cold water. Lay next to chicken in baking dish. 4. Melt stick of butter in a bowl. Drizzle over chicken and potatoes. 5. Sprinkle Italian dressing mix over chicken and potatoes. Add salt and pepper to taste. 6. Cover dish with foil and bake in oven for 1 hour. 7. To see how I made my asparagus, check out my past post here. Enjoy!! I saw this idea on a random website and it looked really simple, so I attempted it. I made this for my cousin's annual 4th of July party. So cute! 1. Mix the cake mix, eggs, water, and oil together and bake in the oven according to the box directions. 2. Allow the cake to cool for at least an hour. Frost with white frosting (I used cream cheese, but vanilla is fine, or any other white frosting flavor). Frost that bad boy like your life depends on it! 3. Wash the blueberries and strawberries. Cut the strawberries in half length-wise, and the halves one more time length-wise. 4. Fill the upper left hand corner of the cake with rows of blueberries for the "stars." Then, lay the strawberries length-wise end to end across the cake for the "stripes." Almost too good to eat. Almost. Now, proudly display that masterpiece. Then eat it. Happy 4th of July!! As I am sure you know, skincare is of the utmost importance to me. Partially, I have been blessed with good skin genes, but that's only half of it. The other half is that I take really good care of my skin. This includes drinking a lot of water throughout the day, washing my face with a good cleanser twice a day (when I first wake up and right before I go to bed), and using a moisturizer that has an SPF of 15 or higher after each cleanse. I also use a scrub and do a facial masque at least once a week. I switch up my cleanser each time it runs out also, because after a while, my skin seems to become immune to it, or it doesn't work as well as when I first started using it. All of these things keep my skin looking healthy and young. Literally, that is my secret. I am always excited when I find a new skincare product that I really like and that works for me. When I first heard about the Clarisonic Mia, I was a little skeptical. I decided to give it a try anyways, to see what all the fuss was about. Clarisonic Mia, I ordered it from Amazon! I guess you could say this is a bit like having a Sonicare toothbrush...for your face! The Mia comes with 2 pieces (charger and body) and a facial cleanser. As a note, you do need to charge the Mia for 24 hours before you use it. I didn't realize this until I was all excited to use it, and then had to wait an additional day. Dang! To charge it, the charger has a magnetic piece and it just slides onto the base of the body. Plug it in, and let it charge for a full day. Once fully charged, get the bristles damp with a bit of warm water. Apply a dime-sized amount of cleanser (any cleanser will do fine--I just decided to try the trial-sized one that came with the Mia). Press the button on the handle to turn the brush on. The bristles are actually very soft and don't stretch or scratch your skin at all. You want to avoid around your eye area because of the delicate skin that is there, but everywhere else is fine. Start on one side of your face and use gentle circular motions until you work the cleanser onto the entire surface of your skin. The Mia runs for a minute, so if you need longer than that, just press the button again. I needed to press it once again in order to finish. After your face is covered, gently rinse it in cold water and gently pat dry with a towel. Apply your favorite moisturizer and you are finished! My skin felt amazing! I didn't see as many blackheads after using this, and my skin felt smooth and soft. I am definitely hooked and will continue to use the Mia on a frequent basis! Sup dudes? It's been a while, I know--I am sorry! I have been so busy with my new job that I have barely had any time to even return phone calls. I have a newly discovered obsession though, and it's called Birchbox! I know I am probably a little late to this fad (as I usually am), but basically it is a subscription for $10 that you sign up for, and every month they ship you a box of sample sized beauty products to try. It's a great way to try out new products and find some that you love and didn't even know existed! Plus, who doesn't love getting a package in the mail on a monthly basis!?! I decided to give it a try. Like Pinterest, you have to actually sign up first to be invited. It took me about 3 days to get invited, but it was well worth the wait. Here is the box that arrived! (The outer shipping box was pretty and bright pink but I annihilated it in my excitement!) The theme is "Wanderlust," or the love of travel, which is something I can really get behind! 1. The shampoo was pretty good. It is Indian fig, so it smells a bit light and floral. I'm not a huge fan of that, as I tend to lean toward the fruity smelling stuff like Herbal Essences. But overall, its not overpowering. 2. The conditioner was amazingly rich and smelled floral too. When you lather it in your hands, it feels like a thick, luxurious moisturizing lotion. It left my hair feeling very soft and helped a lot with my tangles. I highly recommend this one! 3. The hair oil smelled citrus-y and added some good shine to my hair. I just squeezed a few drops of this on my hands and finger combed it through my locks. It left a nice, glossy finish. 4. The body scrub was nice and luxurious, but I wasn't crazy about the scent--but then again my sniffer has been a bit off because of allergies. Although, as a side note, I know this is Oscar de la Renta and all, and I probably should have attended some sort of fancy event in a ridiculously expensive ball gown, but I just went through the Taco Bell drive-thru after using it. I know what you are thinking--real classy. 5. The finishing powder was light and absorbed oil well. It kept my face from being shiny all day. I applied it after my foundation to set it. 6. The nail polish is very summery and bright pink. I love pink in general, so this was naturally pretty amazing. I hope you enjoyed my reviews of the products--stay tuned for monthly ones! Birchbox rocks my socks! !